Alexander Vaulin was born in Moscow in 1950, studied at the Gnessin Music School, Moscow and was awarded their Gold medal. He continued his studies at the Piano Faculty of the Moscow Tchaikovsky Conservatory under Nina Lelchuk, Kirill Vinogradov and Professor Piotr Romanovsky, graduating in 1973. Vaulin later attended master classes under Professor Paul Badura-Skoda in Vienna and received creative inspiration from pianists such as Gilels, Richter and Ashkenazy. The constraints and the oppressive atmosphere in the USSR forced Vaulin to leave his country in 1987. Since 1989 he has lived in Denmark and has since gained Danish citizenship. Norwegian composer Edvard Grieg wrote From Holberg�s Time (Suite in Olden Style) in 1884 following a commission to celebrate the 200th anniversary of Ludwig Holberg, the Norwegian-born author and playwright. Grieg responded with the piano suite set in five movements; prelude, saraband, gavotte, air and rigaudon, that he described in an �old style�. The retrospective is limited to the forms of old dances which Grieg took from French baroque suites. In actual fact the musical idiom is Grieg�s own to which he adds humour to provide a taste of freshness. Grieg�s arrangement of the piano score for string orchestra, known as the Holberg Suite, has become an extremely popular work. Works for solo piano comprise only a modest part of Sibelius�s large output. There is a youthful Piano Sonata and the remainder are mainly pieces with a strong salon flavour. The Three Lyric Pieces from 1904 are grouped under the title of Kyllikki and are generally regarded as the most important of Sibelius�s piano works. With the three Kyllikki pieces Sibelius takes the listener into the world of Finnish myths and legends. The title of Kyllikki comes from the Finnish national epos, the Kalevala, a subject that fascinated Sibelius. From Finnish Mythology, Kyllikki was the name of a maiden who was abducted by Lemmink�inen to become his reluctant wife. The Three Lyric Pieces, which demonstrate Sibelius�s symphonic way of composition, are all different in character. The first, largamente - allegro is explosive and violent, the second, andantino is meditative and melancholic and the third, marked comodo is capricious and dancing. The composer and conductor Wilhelm Stenhammar was considered the finest Swedish pianist of his time. In spite of his talent for the keyboard, Stenhammar actually wrote only a few works for the piano. Besides his Piano Concerto, Op. 1 from 1893 and the Piano Concerto No. 2 from 1902-07, which are both heavily influenced by Brahms, there were only the Piano Sonata in G minor and three series of smaller pieces. The unpublished Piano Sonata in G minor from 1890 was thought lost and only discovered after the composer�s death. For a work from a nineteen year old the four movement work is a surprisingly mature and comprehensive score, extraordinarily well laid out for the instrument. It is predominantly Schumannesque in spirit and is full of beautiful melodies. Surprisingly for a work that was composed over a hundred and fifteen years ago a printed edition of the score does not yet exist. The opening movement is real Sturm und Drang stuff. The slow movement is a romanza clearly inspired by the slow movement of Schumann�s F-sharp minor Piano Sonata. The movement�s perpetual melody is acknowledged as one of the most beautiful in Swedish lyrical music. The third movement scherzo is a capricious and elegant piece with a quiet middle section that resembles the style that Chopin often used in his scherzos. The concluding movement is written in the classical rondo-sonata form and is extremely virtuosic, passionate and fiery in expression. The movement develops itself in a perpetuum mobile motion with a slow nostalgic episode before the bravura coda. ClassicO provide informative, well-written booklet notes with decently recorded sound quality. 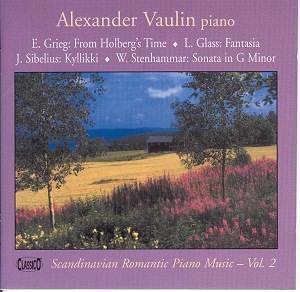 Alexander Vaulin gives an enjoyable recital of a fine selection of Romantic Scandinavian piano music.